Wakefield Rotary Donates $1,000.00 to The Peace Dale Dinner Table. 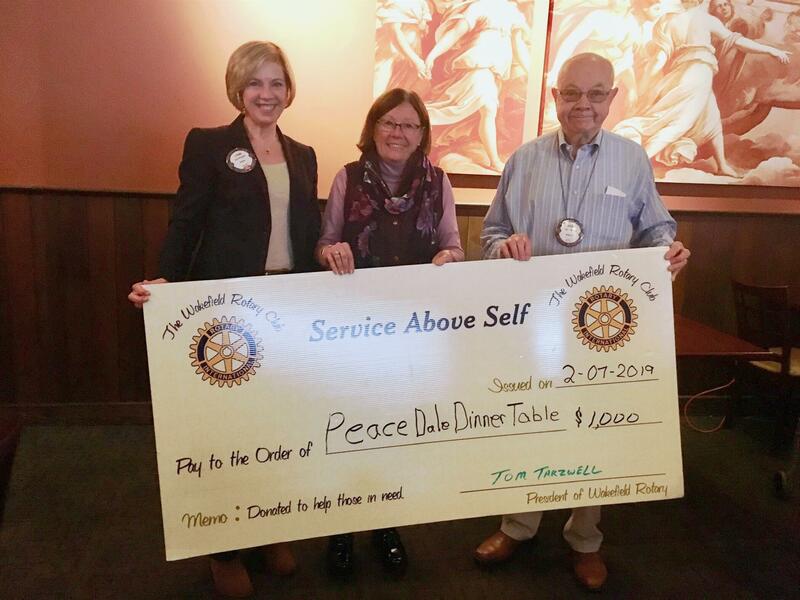 Pictured here is Harvey Whitley, the Chair for the Wakefield Rotary Charitable Committee, Lynn Wagner from Wakefield Rotary and Cindy Fish a volunteer for the Peace Dale Dinner Table. The Peace Dale Dinner Table is entering its 5th year and exists to provide healthy meals to children and their families, those who live alone, and the hungry. Every Wednesday, between 4:30 and 6:00 P.M., our community is invited to eat a delicious home cooked meal in Peace Dale Congregational Church’s Fellowship Hall. Volunteer chefs prepare and cook the food. Volunteer wait staff serves our guests, and members of the congregation provide transportation. There are approximately 60 meals served each week. There is no charge for the meal or transportation. On New Year’s Day, Don and Betsy Wisehart, Spencer Setiz and myself participated in a Penguin Plunge to benefit a non profit agency described as the WARM Center Located in Westerly. The plunge was held at the Windjammer Lounge located in Misquamicut. The Warm Center provides 19 beds for the homeless along with serving over 100 meals per day. This endeavor was to promote how Rotary participates in community events supports other non profits. Although this event had approximately 300 participants the Warm Center Executive Director Russell Partridge was excited to see members of a local Rotary club being part of their event. HIGHLIGHTS: No guest speaker today; however two excellent musicians of the Kingston Chamber Festival Group treated us to our annual private chamber concert. They performed a three-movement piece written for classical guitar and cello. Truly one of the highlights of the year. District Governor Russell Bertrand had the pleasure of presenting the 2017 Dr Percy Hodgson Memorial Award to our very own Herbert Mansfield at the recent Multi-District Conference. Shown below, Herb receives the award in the presence of many from our club who attended the conference. This award is the highest award given by District 7950! It is a 27 year tradition not to be taken lightly. All Clubs are asked to nominate one of their members. A panel of seven members determine the awardee and a DG or PDG is not eligible. Congratulations Herb, we are all very proud of you, our fellow club member for receiving this honor. If you use a smartphone, you need to try out the Clubrunner App!! It's available on multiple devices including Iphone, Android, Blackberry and others.